Pat Hume, the wife of civil rights leader John Hume, will receive a Lifetime Achievement Awards at tonight’s ceremony. 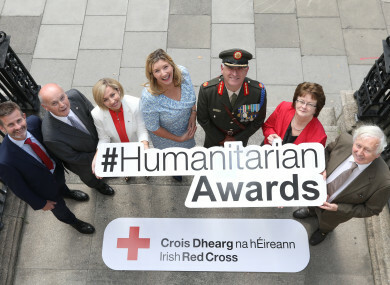 FINALISTS FOR THIS year’s Irish Red Cross Humanitarian Awards include the late Emma Mhic Mhathúna, housing agency Ó Cualann and RTÉ journalist Katie Hannon. The awards – which include a Humanitarian of the Year honour – take place this evening in Dublin. Nominated for the Student Initiative Awards are Niveta Ramakrishnan – who helped organise “Fáilte: Facing the Global Refugee Crisis” for the Royal College of Surgeons. Tullamore College Students, who campaigned to prevent their classmate - 14-year-old Nigerian student Nonso Moujeke – from being deported, are also nominated. As is 19-year-old student Jessie Clohisey, who set up Sail Against Suicide. For their journalism, Maggie O’Kane, Shaunagh Connaire and RTÉ Prime Time’s Katie Hannon are nominated. O’Kane implemented and sustained The Guardian’s Global Media Campaign against Female Genital Mutilation and has now formalised the entity as an independent charity. For the past two years, Connaire has reported on the lives Syrian refugees in the Middle East and Europe while RTÉ’s Hannon is nominated for her four-year work on the Maurice McCabe story. Tech for Good Dublin, Ó Cualann housing agency and FoodCloud are finalists for the Innovation for Change Award while Pat Hume – wife of former SDLP leader John Hume – will receive a Lifetime Achievement Award. The late Emma Mhic Mhathúna – who was diagnosed with terminal cancer following two incorrect smear test results – is nominated for Humanitarian of the Year for her work surrounding the cervical screening controversy. The mother-of-five launched legal action and received a settlement of €7.5 million. Mhic Mhathúna became one the most public figures throughout the controversy and was one of 209 women whose smear tests had been incorrectly read. She died on 7 October. Mark Mullan – who negotiated with Syrian authorities for the delivery of aid to assist 30,000 people in eastern Ghouta – is also nominated for Humanitarian of the Year. Alice Leahy, who established the Alice Leahy Trust in 1975 – a social and health service for homeless people – is also nominated. Tonight’s Irish Red Cross awards aim to raise funds for vulnerable children and families in Ireland and overseas. Email “Emma Mhic Mhathúna among Irish Red Cross Humanitarian Awards finalists”. Feedback on “Emma Mhic Mhathúna among Irish Red Cross Humanitarian Awards finalists”.